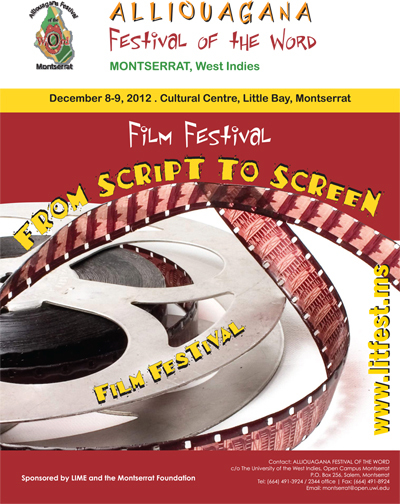 Sponsored by LIME and The Montserrat Foundation. To promote a world class annual literary festival that connects partners, sponsors, artists, musicians and creative writers in a celebratory environment and fosters unparalleled development in local publishing. We strive to attract growing numbers of visitors, award winning authors, and publishers to sustain economic and cultural growth in Montserrat through mutually beneficial linkages with local, regional, and global markets. The Steering Committee for the Alliouagana Festival of the Word owes a deep debt of gratitude to the presenters who have generously agreed to participate in the Festival and the numerous volunteers who have given of their time, talent and resources. The assistance of the Montserrat Tourist Board and all sponsors and partners is also deeply appreciated. Together we will build an event that can be enjoyed by all and which will contribute to economic, social and cultural development on the island of Montserrat.